New research revealed today by Adzuna and Silicon Milkroundabout show a huge increase in demand for talent in UK tech startups, and reveal that startups are offering salaries up to 17% higher than industry averages to attract the best candidates. London, UK, 00.01 AM Thursday 10th October 2013: Silicon Milkroundabout, the UK’s leading recruitment event for tech startups, and Adzuna, the search engine for classified ads, have today revealed new figures that show that there are more jobs than ever before in UK tech startups, and the competition for tech talent is intensifying. Tech hubs around the country, including east London’s Silicon Roundabout/Tech City cluster, are hiring for 4,753 positions, up 44% since 2012. Software developers are in hot demand with 1,473 jobs currently on offer (+31% since 2012), with marketing roles second at 1,142 (+78% on 2012) and product at 570 (+8% on 2012). The joint research also surfaces the key attributes the UK’s tech startups look for in new recruits. Alongside the more recognisable requirements (“highly skilled”, “able to get things done”, “great in a team” and “smart”), startups value personality traits such as “curiosity”, “humility” and “being nice”. As for what they offer, UK tech startups now compete on salary for the best people – suggesting that the traditional advantage banks and bigger technology companies have held over startups is lessening in importance. A software developer in a UK tech startup can expect to earn an average of £45,088 p.a., 17% higher than the tech industry average, and a designer can expect £38,692 p.a. (+5%). Salaries for roles in Product Management (£37,517, -6%), Marketing (£31,000, -12%) and Sales/BizDev (£28,594, -14%) are comparable to industry norms. In addition to salary, someone considering joining a UK tech startup can expect to be promised a wide range of other benefits. From startup-specific pledges (“share options”, “backing by respected investors”, “fast growth”), to an emphasis placed on the benefits of smaller teams (“make an impact”, “challenge”). “Flexible working hours” and “choosing your own equipment” also featured prominently. 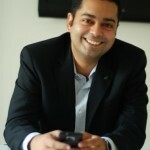 Individual companies tout their own quirks, such as “18 languages spoken in the office” (Busuu.com, language-learning), all-company international away-days (King, social gaming), and fun missions like “spread[ing] happiness through unforgettable singing experiences” (Lucky Voice, karaoke)! “In the last 3 years UK tech startups have established themselves as a genuine alternative career path to financial services or the big tech companies,” says Cristiana Camisotti, co-founder of Silicon Milkroundabout. The Silicon Milkroundabout jobs fair returns to east London’s Silicon Roundabout/Tech City cluster on 16/17 November seeking to match 120 of the UK’s top tech startups with up to 3,000 developers, product managers, designers and marketers. At the two-day event, the diverse range of startups – including Badoo, MOO, King, Shazam, Mind Candy, Plumbee, Geckoboard, TransferWise, Busuu.com, onefinestay, VisualDNA, graze and Funding Circle – will be seeking to persuade the most talented attendees to take one of the 800+ jobs on offer. 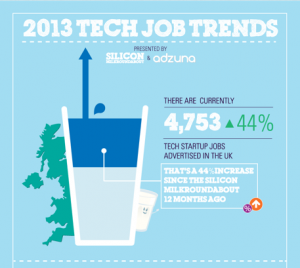 Adzuna‘s study analysed over 500,000 UK jobs ads and 250 startup companies in September 2013 to determine the number of tech startup vacancies in Britain, salaries paid and most in demand roles. This data was then benchmarked against an identical study from 2012 to show year on year metrics. Silicon Milkroundabout surveyed 50 of their exhibiting startups in September 2013 for key trends in their hiring patterns and what they require from new recruits in terms of skills and personality. Jobseekers in the fields of Product Management, UX Design (Interaction Design, Visual Design, User Research and Prototyping), Intelligence/Analytics, and Tech Marketing/Growth. Jobseekers in the fields of Software Engineering, Web Development, QA/Testing, and TechOps.